Tablesettings provided by Barb Hamilton-Sustad and Cindi Sutter. If you’ve been golfing long enough, you’ve probably felt like I, this summer and fall…Let me count the ways golf is messing with my head. We golfers are a weird sort. Sometimes we practice perfectly and play horrifically, and other times the vinyl (record) is flipped over and our dream round of golf just happens, bad practice, bad weather aside. Tee up your favorite snacks, beverage and friends of choice. This Friday, Team U.S.A. faces off once again with Team Europe, dreaming of the moment one of them hoists the Ryder Cup trophy, in honor of their country. The high-traffic corner of professional sports stops for a few moments in time and holds hands to honor their country. A near perfect sports moment…if your team wins. When it’s over, golf, a lifetime sport, is the winner. Thanks to Hazeltine National Golf Club, host of the 2016 Ryder Cup for providing these images. I know, you’ve heard so many reasons the U.S.A. has only won 2 of the last 9 meetings, now you're tired of the pontificators and just want the players on the first tee, asap please. Some insist that one reason for the losses are spoiled players — the individual trumps the team…Hmmm…did you hear Phil Mickelson stand up for his teammate in 2012 when all media outlets decided that one shot was the reason the Cup was being filled with Guinness instead of a U.S.A drink of choice? Really? Do the math. Twelve players, most of whom play at least one round everyday for 3 days and you’re going to hang defeat around one player? Come on, man! Needless to say, this particular group not only shocked the world with their comeback, but they were a team! I attended the Ryder Cup in 1997 “where for the first time in Ryder Cup history, the matches at Valderrama in Sotogrande, Spain, were played in continental Europe. And, there was a very special European captain for the occasion -- Seve Ballesteros.” Seve’s memory is certainly a driving force behind Europe’s team, but the U.S.A team holds Seve’s masterful approach to the game in their hearts and minds as well. So no matter what, they win or lose as a team. 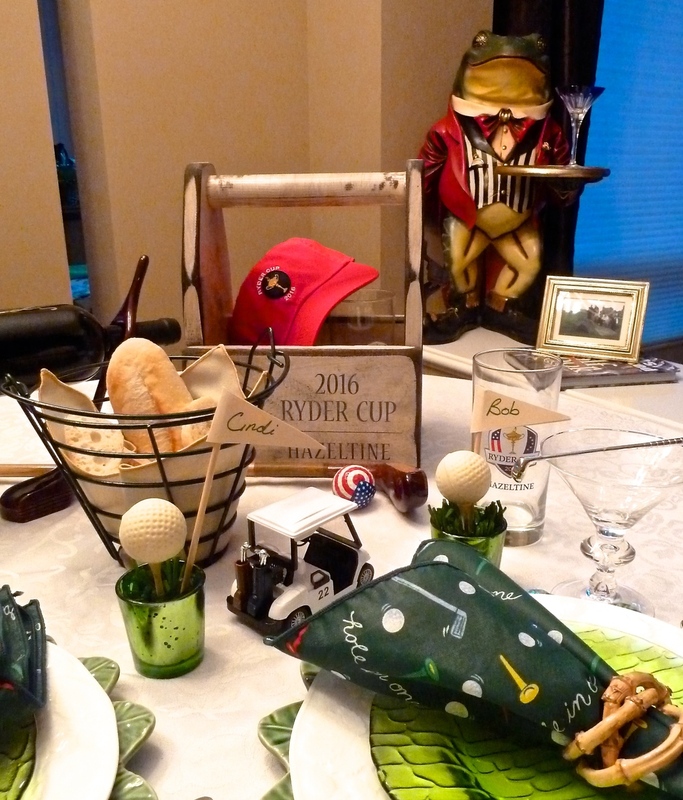 Sports defines our fall weekends in many ways, but at our house this weekend, it’s all about finding a comfortable spot to sit, watch every swing, cheer, discuss the putt not given that should have been, and top it off with a table set to celebrate a dream come true for the U.S.A. and our Ryder Cup team! In memory of Gary Sustad whose infectious love of golf and life brought enormous joy to him and everyone crazy enough to tee it up with him. 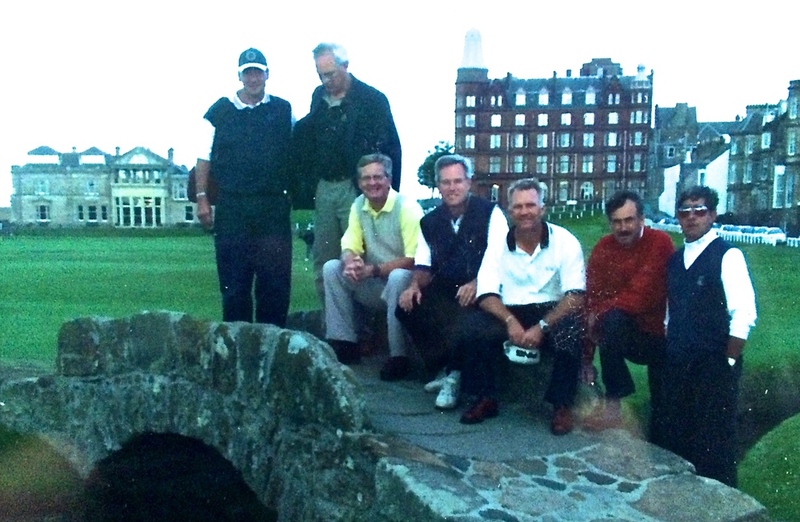 It's a bit hard to see, but check out the photo in the background of Gary poised on the bridge at the Old Course at St. Andrews, that has seen the likes of Arnie and Jack. But on this particular day his team of 4 provides the perfectly on par backdrop, to remind us all: celebrate with friends and family around a spirited table, with love, laughter and the optimism standing on the first tee provides.